A few weeks ago a skeptic asked me about my concerns with the multiverse as an explanation for the beginning and fine-tuning of the universe. He stated that he did not want a scientific critique, though, because he believes that the multiverse is outside the ability of science to test. He was more interested in my philosophical concerns. Four issues come to mind. None of them remove the possibility of a multiverse in a theistic world; however, two make the multiverse unpalatable in a naturalistic world, and the other two do remove it from possibility in a naturalistic world. I will start by showing the power of the multiverse as an explanation, and at the same time, I will show how two of the issues make a naturalistic multiverse impossible as a naturalistic explanation (but do not necessarily rule it out). I will then describe the two issues that make the naturalistic multiverse even less desirable as an explanation. Finally, I will conclude by demonstrating how all these issues are consistently and comfortably resolved by a theistic worldview (with or without a multiverse). Current inflationary models and theories of quantum mechanics seem to support the idea that our universe is not the only one that exists. Some theories allow for numerous and even an infinite number of universes. This ensemble is often called the "multiverse." As mentioned in the introduction, with the apologetic arguments for God's existence from the beginning of the universe and the fine-tuning of the universe for life, such an alternative explanation seems to hold promise to unseat God from His throne as being the only explanation of the scientific evidence of a beginning and design of the universe. Many skeptics claim that concluding "God exists" from the apparent design and beginning of the universe is merely a "God-of-the-gaps" argument. The process of elimination is a valid way to argue for a conclusion, but only if all other options have been logically removed. Since the multiverse is now on the table as a possible explanation for the beginning and apparent design of the universe, all alternatives to God have not been removed. Unless the theist logically removes the multiverse from the list of options, the claim that they are employing a "God-of-the-gaps" argument is legitimate. If we can logically eliminate the multiverse from the options, then God is left as the conclusion, and no "God-of-the-gaps" reasoning has taken place. The first issue that I have regards fine-tuning. The skeptic requested that I stick with philosophical arguments, so I will not introduce anything observable regarding the multiverse, rather I will only appeal to what has been observed in this universe. The current evidence in cosmology and biochemistry show that the universe's physical laws are extremely fine-tuned for advanced life's existence and that a statistically impossible series of events took place to result in the origin of life (See "Origins of Life: Biblical and Evolutionary Models Face Off"). Without a great multiplicity of universes to get the physical laws correct and the series of events to lead to advanced life correct, the only option is that an intelligent agent (God) finely-tuned the universe's physical laws and guided the series of events with the explicit purpose of resulting in advanced life. The multiverse seems to be able to provide such a resource of a nearly infinite number of universes that would practically guarantee the emergence of advanced life in at least one of them without the necessity of a Designer. The problem that exists here is that the skeptic must assume that the multiverse necessarily generates an evenly distributed combination of universes that have the many different possible sets of physical laws. However, as Dr. William Lane Craig often argues (see this video and this debate), this specific outcome would require that the multiverse, itself, be finely-tuned for the specifically required outcome. Instead, if the multiverse were not finely-tuned, stasis of all "settings" would be the natural state of the multiverse, and it would naturally only produce universes consistent with that static set of settings. Since there are orders of magnitude more combinations of physical laws that are hostile to life, the probabilities that the "correct" settings (for life) would be the natural one at the multiverse's state of stasis reintroduces the teleological problems attempted to be resolved in this universe. The fine-tuning has not been removed, it has merely been shifted from this universe to the multiverse. The fine-tuning problem is merely moved one step back: the multiverse now requires a Designer. So, the multiverse as an alternative explanation to God has been removed from the table. But the fine-tuning is not the only issue that removes the multiverse as a viable alternative to God. The current evidence in cosmology is overwhelming that the universe had a beginning in the finite past. If the universe began to exist, then it must have a beginner that is outside of space and time. God is often offered as that Beginner. However, the multiverse is also outside of space and time and is posited as the naturalistic alternative beginner. One of the great pieces of evidence of this universe's beginning in the finite past is the expansion of the universe coupled with the Borde-Guth-Vilenkin (BGV) theorem (which establishes that anything that expands on average over the course of its lifetime has a beginning). What is quite interesting is that the multiverse is not immune to the BGV theorem, for the theorem is not limited to this universe but extends beyond it. In the multiverse, new universes are being generated constantly, which results necessarily in the multiverse's expansion. The BGV theorem constrains, even the multiverse, to a beginning outside of itself. This would require some kind of multi-multiverse, but that would require yet another a multi-multi-multiverse, and so on, resulting in an infinite regress of multiverses. An infinite regress of beginnings is not possible, so the multiverse, again only pushes back the issue by one level. It must also have a beginning and a beginner, so it has effectively been removed from the table a second time as a viable alternative to God. Both of those issues do appeal to observations in this universe but not the multiverse, so they satisfy the skeptic's requirements. However, the next two issues are purely philosophical and may actually be closer to what my skeptic friend had in mind. I will start with the epistemological issue (how we know what we know) then move on to the moral issue. Alvin Plantinga argues in his book "Where the Conflict Really Lies" that naturalistic processes that are focused on mere survival cannot necessarily account for brains that recognize what is true. Many different beliefs have practical application for survival but are not true. An example that skeptics would find difficult to deny is various religious beliefs throughout history. Certain religious beliefs allow for certain behaviors that would ensure the survival of those societies that held to them by subjugating or destroying other societies in the competition for limited, life-sustaining resources. Many of these religious beliefs have been found to be false. Religious beliefs are not, however, the only type of beliefs subject to being wrong yet promoting survival. Since naturalistic processes can only produce a brain that survives (as opposed to one that recognizes truth and chooses it over survival), and there is no necessary connection between survivability and truth (and some would even argue that the connection between falsehood and survivability is very strong), then we cannot trust our brains to accurately comprehend reality. Thus, any conclusion about reality (which is generated by our survival-focused brains) is untrustworthy. If the conclusions about reality are untrustworthy, then no knowledge is possible. There are many more false views of reality than there are true ones. Since there is no necessary connection between survivability and true beliefs about reality, and since multiple false views can and do result in true and practical beliefs and behaviors, then there is already a much greater probability that one would hold the wrong belief. This is devastating enough with the single universe. But if there exists a multiverse (infinite or not), the number of true propositions multiplies and the number of false ones increases by orders of magnitude. This further reduces the probability that people hold to true beliefs, including the belief that the multiverse is true or that atheism is true. A naturalistic multiverse takes everyone even further, than Plantinga concludes, from any level of knowledge than they already believe about reality. If knowledge in a single naturalistic universe is improbable, then knowledge in a naturalistic multiverse, with its orders of magnitude of more false propositions, is indistinguishable from impossible. Just to be clear, this does not mean that the naturalistic multiverse does not exist, it just means that if it does, then knowledge is, for all intents and purposes, unattainable. Evil poses a powerful emotional challenge to both theist and atheist. The theist claims that God has morally justifiable reasons for allowing evil and suffering (even that which is the result of free human beings). However, this response that reconciles the logical problem of evil with theism rarely does what is necessary to address the emotional pain. And depending on the level of the pain, we question why we bother dealing with that particular situation or even life. The argument against God from evil and suffering appeals to our dissatisfaction with the level of evil and suffering compared to the purpose for it. If the evil and suffering outweigh the purpose, then the situation and even life make no sense. Atheists affirm that any God that exists would have a sufficient purpose that outweighs all the evil and suffering, but they deny that any such purpose is possible to justify the amount of evil and suffering that exists in this world. Their conclusion not only is that God does not exist, but that life makes no sense at all. The multiverse necessarily requires that this universe is not the only one with sentient beings. Any universe with sentient beings is going to have evil and suffering. The reality of the multiverse is that the amount of evil and suffering increases as the size of the multiverse increases, and if the multiverse is infinite in number and duration, then so is the evil and suffering. If the atheist already believes that life makes no sense at all because of the amount of evil in this universe, how much more they must believe that life makes no sense if the multiverse exists. Naturalistically speaking, all four of these pose serious problems. However, if God created the multiverse and this universe, we not only have a Beginner and Designer of the multiverse, but we have a foundation for knowledge (God's being the Creator of our brains with the ability to discover truth), and we know that God has a purpose for the natural and moral evil, which will one day be destroyed; if a naturalistic multiverse exists and continues to produce worlds with natural and moral evil, they will never be removed and there is no purpose for them. However, if God did create the multiverse, then He has a purpose for the evil and suffering He allows and He will destroy evil and suffering once it has served its purpose. 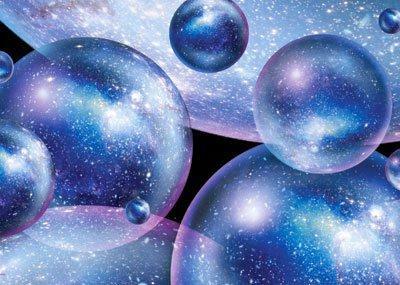 Even though it seems that the multiverse may be a viable alternative to God as an explanation for the beginning and fine-tuning of the universe, when more deeply investigated, it becomes evident that it is not. The multiverse's issues do not end there, though; knowledge and evil also pose serious philosophical issues for the multiverse. However, if the multiverse exists, all of the problems and impossibilities are resolved completely with God. Even if the multiverse accurately explains the beginning and fine-tuning of this universe, the conclusion that God exists and is the Creator still cannot be escaped. Only two of these "objections" are anything to do with cosmology. "He stated that he did not want a scientific critique, though, because he believes that the multiverse is outside the ability of science to test. He was more interested in my philosophical concerns." A note about beginnings: Our bibles begin with the Hebrew word בְּרֵאשִׁית, which means, literally, "In a beginning." A multiverse is not antithetical to the Biblical tradition, nor does it obviate the need for a Creator. It is arguable that, quite to the contrary, a multiverse makes God logically necessary.